I woke up one morning and looked to my left. There was no one there. The person I was with the past 20 years was now gone. I panicked. The feeling of being alone felt like the worst thing in the world. My heart was broken and I did not want to get up. I did not want to face my new reality. Most of us can relate to times like this. The very thought of being alone can be so uncomfortable, sad, scary and depressing. Yet we are destined to experience this during our life (e.g. the loss of a loved one, divorce, break-ups, illness, etc.). It is during these times that we can develop an inner strength that few other events in life can equal. We find the courage to go on even when at times we may not want to. It can be a time of self-discovery and learning how to find YOUR way. These events serve as wake-up calls when we stop and contemplate the meaning of life and our own purpose. 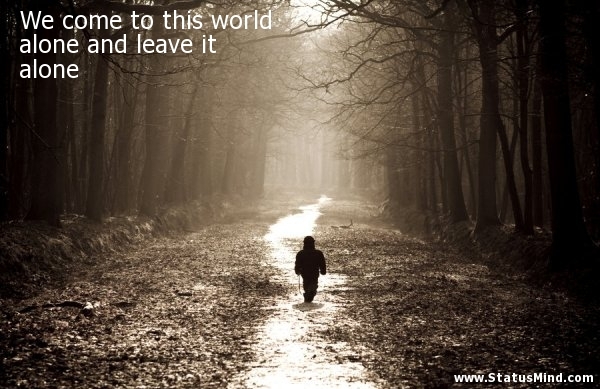 It will ultimately prepare us for our final journey in life, when we leave life as we know it. But getting to this point of being comfortable being alone can be a real challenge. Many of us will fall and some may never get up. Those who persevere often look back at these times as some of the most challenging times, yet ultimately an amazing time of renewal and re-birth. The common element here is that we find ourselves alone, even when there are many around us. Unfortunate circumstances or our own decisions can sometimes put us in a position where we have no one to turn to. Even if your lifestyle is a comfortable one, the pain of feeling unloved can be so overwhelming that you can start to think about not wanting to be here. Source: Psychology Today. Link to article. Why do we feel so alone? Others are uncomfortable around us. What I find odd about humanity is that we all experience significant challenges at times in our life. Therefore you would think that we would be better skilled and able to deal with others when they are experiencing such challenges. And yet, this is not always the case. It is like we forget how it felt to be so alone ourselves. But in fairness to humanity, we sometimes cannot relate to the nature of another’s loss, feeling awkward, not knowing what to say, along with a tendency to want to avoid depressing situations. Significant changes bring with it significant emotions, including anger, sadness and depression, emotions that are difficult to be around, and can impact even the most emotionally mature and willing individuals. Being around these situations can only resurrect our own fears related to experiencing these situations ourselves. We can be there for the short-term, but for any and all of the above reasons, begin to avoid others as we try to get back to our own life. Others are prone to give us advice vs. listen with empathy. There is the tendency for others that care about us, and often with good intention, to give us advice, which may have worked for them, but may not be what we want or are ready for. There are others who want to push their advice on those going through change, who feel that they know what is best for us. In either case, what is missing is the time to understand and listen with empathy to what we are feeling and experiencing. Others may even know what is best for us, but forget that we need the time to process our emotions, fears and concerns first. The reality is that we need to be heard, which is why we often need to, and I strongly suggest, seek out a counselor or therapist to help listen and guide us. Another aspect is a result of our fears about being alone. We are social creatures and enjoy companionship and friends. When this disappears, we feel alone and abandoned. We feel lost, scared, overwhelmed, and in need for a hug and someone to hold our hand. We are not a society that promotes learning to be comfortable with aloneness. It often requires strong self-esteem and self-confidence to be comfortable in these situations. Without these, we are prone to translating aloneness to mean loneliness. How can we learn to be comfortably alone? As an adult, I am a strong proponent of finding a counselor that you can learn how to understand and process your feelings. 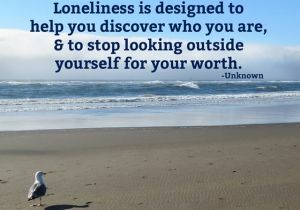 There are many resources available to help initially with these feelings of being alone. The article above provides some great ideas. Support groups are a great way to meet others who share similar challenges. There are growing groups like Meetup.com where you can find others with similar interests or discover new interests. I have just recently experimented with this and found a new love for board games. I have met some wonderful people and enjoy the time. It is not easy at first. Our emotions cause us to panic and seek a quick solution. Unfortunately there are many quick solutions that can be very unhealthy and damaging to us long-term. This is where I had my phone list with people I felt comfortable enough calling. Within the ACOA support group were veterans that offered to be mentors. You may need to find a way to be with others at first, even if you feel alone with them, until you are ready to sit at home and watch a new TV show, listen to your favorite music, take a walk, or discover a new hobby. Be patient with yourself, but don’t fall prey to a short-term fix. 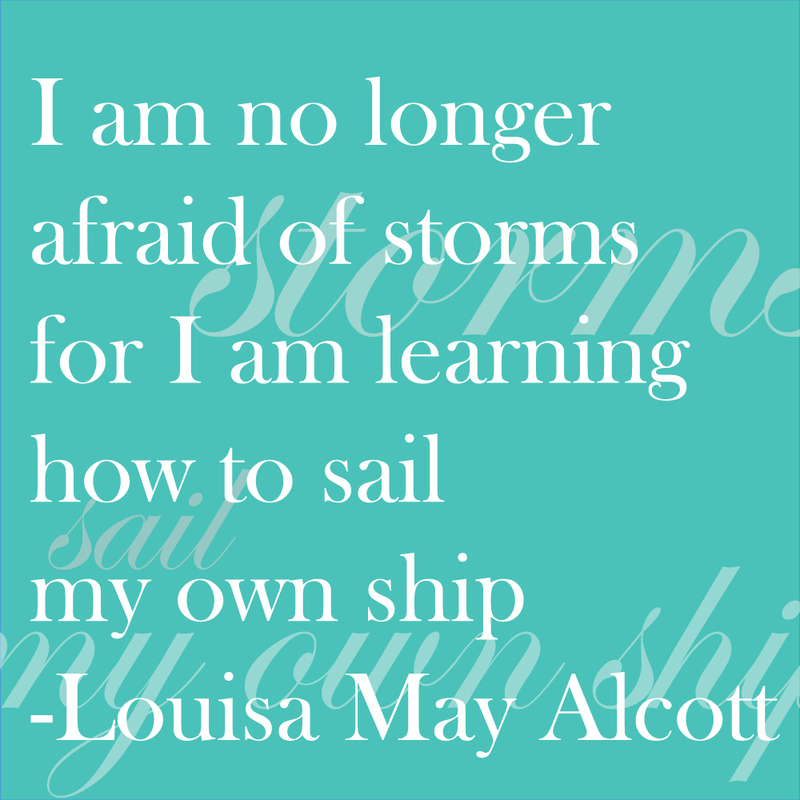 This is where you begin to develop new courage and strength. What if the feeling of being alone persists? 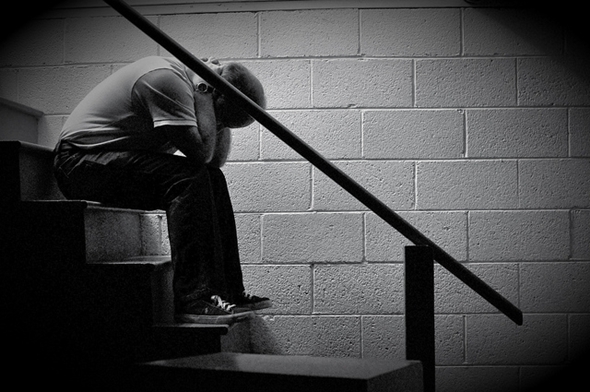 I was in my early thirties and had made a lot of progress in therapy. I came to understand the impact of my past, and the unhealthy beliefs that were formed. I began to look in the mirror and like who I saw. A lot of growth in terms of self-esteem and self-awareness. However, despite all of this, there was a thirst I could not quench. I had no idea what it was. I continued to feel alone and different. For the longest time, these feelings only reaffirmed my earlier beliefs that there was something wrong with me. Sometimes, our aloneness stems from a deeper challenge or question that nags us. The support of a counselor or therapist may prove to be helpful in understanding what is going on. But in my case, I continued to feel lost and unable to pinpoint what this was all about. It was several months later a colleague of mine, aware of my situation, placed the following quote on my desk. For the first time in a long time, I did not feel like a lost soul, a misfit, a loser. I was indeed in search of something, in my case a call to the meaning of life and how I fit in. That was it! I had to understand why there was so much pain and so many challenges in my life. I was not interested in blaming my life on others, but instead on finding my way. But it was a way that no one had ever talked about until I read this quote, a road less traveled indeed. I was fortunate to have been in a position to hear my spirit and do something about it. I did what any abnormal person would have done in this situation, I quit my job, and hung up my corporate career for a backpack and a modern-day vision quest! Sometimes our feeling alone is a result of a desire to soul search and find oneself. We can find ourselves feeling lost in a society that is quick to judge what is normal or abnormal, what is right vs. wrong, what we should believe, and how we should live our life. We are conditioned to believe in what others prescribe to be happiness and success, but what we find meaningless. It was during a conference that I had learned how traditional societies such as the Native American Indians, and tribes in Africa, sent their young men out of their tribes until they had a vision or understanding of who they are. A great portrayal of this was in the movie, Dances with Wolves, where Kevin Costner’s character used solitude and journaling to discover his true values and beliefs. The pivotal moment came when an Indian chief informed him that he was no longer who he was, but now, “Dances with Wolves”, signifying the event that represented his new truth. In my case I discovered “voluntraveling”, where I would travel to remote locations and volunteer in whatever capacity was possible to learn about the local culture and people. The experiences exposed me to the good, bad and the ugly about the human condition. Upon each return home I felt more and more alone. My eyes were torn open and I saw life for what it is. I wrote in my journal the lessons I was learning about life, only to realize that everything I saw in others, was in part a reflection of who I was. I had my own good, bad and the ugly. This awareness became a double-edged sword. On one side I was learning about life-like I had never seen it before. On the other I was wishing I had never opened my eyes. My journey drew me deeper and deeper within, until I was totally alone. And it was here, at this raw moment that I had realized who and what I was, which was what my quest was all about. I realized that I was not alone after all. I was with 7 billion other comrades who made this journey as well. We all felt lost at times, and would rely on each other and ourselves to find our way back home. Some experienced more difficult and challenging times than others, but somehow this is what we were here for. As the saying goes, no pain, no gain. Apparently I was here to make a lot of gain! It was time to return home and settle down to start a family and begin another amazing experience of trials and tribulations. I would feel lost and alone many times again, but this deeper awareness would guide me back eventually.It is the solitude of being alone, truly alone, that one can discover amazing truths. As the saying goes, “I must do it myself, but I cannot do it alone”. 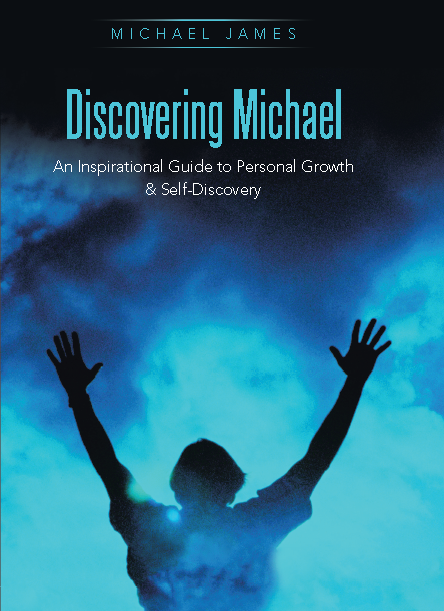 You can read more about my story and perspective in my book, Discovering Michael: An Inspirational Guide to Personal Growth & Self-Discovery.